Maurycy Gottlieb, Jesus Before His Judges, ca. 1877. Gottlieb was one of the first Western figures to profess what today we’d call a hybrid identity—as both a Polish and a Jewish artist. He painted images of Jews from literature (Shylock), history (Portuguese converso Uriel d’Acosta), the Bible (himself as Ahasuerus), and daily life (Jews Praying in the Synagogue on Yom Kippur) before plunging into the charged subject matter of the life of Christ. In Jesus Before His Judges, illustrating the scene from Matthew, viewers can clearly see that the noble, gentle figure of Jesus is Jewish by his clothing and side curls. And they can also clearly see the Romans in the background at the right, a pointed reminder of who was responsible for Jesus’ crucifixion. 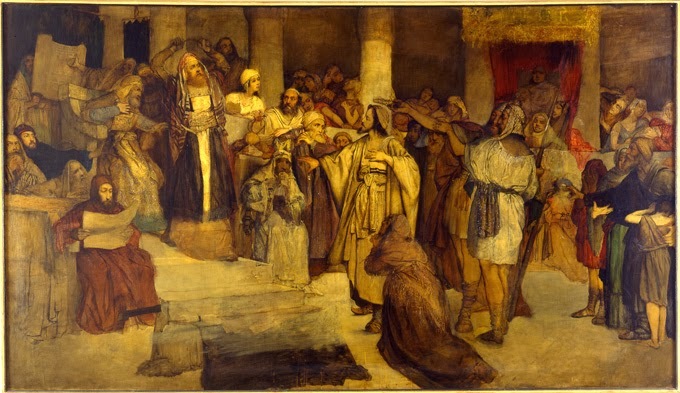 “How deeply I wish to eradicate all the prejudices against my people,” wrote Gottlieb, who went on to paint another scene in the life of Jesus, Christ Preaching at Capernaum, in 1878. His work, he dreamed, could help “uproot the hatred enveloping the oppressed and tormented nation and to bring peace between the Poles and the Jews, for the history of both people is a chronicle of grief and anguish.” Collection of the Israel Museum.